Dearborn SHINES for Healthy Kids! We are so excited to spread Autism Acceptance throughout our school next week with a spirit week (April 15th-18th)! Flyers should be going home but I wanted to post one here on the blog! I cannot wait to see the participation as we all celebrate Autism during our spirit week! April is Autism Awareness/Acceptance Month and we are so proud of our students with autism here at Nowlin! I can’t wait to see everyone participating in the fun days we have scheduled! Please click on the link below to view the Flyer! Don’t forget that in collaboration with the PTA, we are offering parent informational meetings every month. Our seventh parent involvement meeting will take place this Thursday, March 28, 2019 at 3:45 pm in the media center. Our topic this meeting with be on MSTEP and State Standardized Testing. We look forward to seeing those who are able to attend! 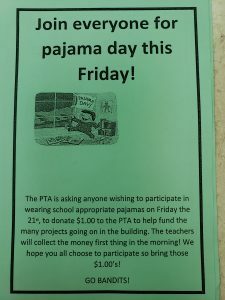 The PTA is asking that anyone who wants to participate in pajama day on Friday, December 21st to donate $1.00 to help fund the many projects that are going on in the building. If you want your student to participate please make sure that the pajamas are school appropriate and that you send in $1.00 with them, I will be collecting the money in the morning. Also, we will be having our ASD holiday party on Friday, December 21st from 2pm to 3pm. Please let me know if you are interested in volunteering your time. Just a reminder that this Friday, November 30th 2018 is our BAKE SALE right after school! There will be lots of goodies so please stop by 🙂 It is not too late to donate baked goods or volunteer your time. We appreciate all of the support and donations. We look forward to seeing all of you! Hey Bandits, all classrooms are still collecting for the canned food drive this year. It ends this week and many classrooms haven’t donated anything. Please check your cabinets and grab what you can spare and send it in tomorrow so we can fill some of these boxes. Last year we collected over 1 ton of donations which benefited so many families in need. This year we have about 100 lbs of food. I know we can dig deeper than this! I look forward to seeing what we can collect in the next two days to show how generous we are at Nowlin. Go Bandits! We are participating in the Battle Against Hunger, a canned food drive sponsored by Zaman International. The drive will take place all of next week, November 12-16. I will sending a flyer home with each student which will have more information, it is also attached below so please check it out. We are looking forward to filling the boxes with canned goods! If you have any questions please let us know! We hope you all had a great time at Fall Fest. We want to send a huge thank you to all of our volunteers and parents who donated items. We couldn’t do it without you. Let’s keep the costume party train rolling! Join us at Lincoln Park Skating Center on Tuesday October 30th, 6pm-8pm. Tickets are $5 presale or $7 at the door and include admission and skate rental. NEW THIS YEAR – two lucky winners will receive a birthday party! So put on your best costume and have a night of roller skating fun! The PTA will be selling skate party tickets after school all week in the lobby. An order form will be going home as well, so keep a lookout for that! Just a reminder that tonight is Fall Fest! It will be going on from 6-8pm! Costumes are welcome but please nothing too scary and no masks. I will be sending home a flier with 4 free tickets (can be used for games, etc.) It should be a fun evening! Hello everyone! Please see the attached flyer for information on the presentation that will be on Thursday, October 11th 2018 at 6:30PM. It might be something that you and your family might be interested in! I was born and raised in Livonia, and I still live there with my family. I have 3 siblings; an older brother, an older sister, and a younger sister. I have 2 nieces and 3 nephews from my older siblings. I graduated from Churchill High School in 2007. I graduated from Wayne State in May 2018 with my Bachelors of Science in Special Education and Elementary Education. I am going back to Wayne State for my Masters in Autism starting this fall!